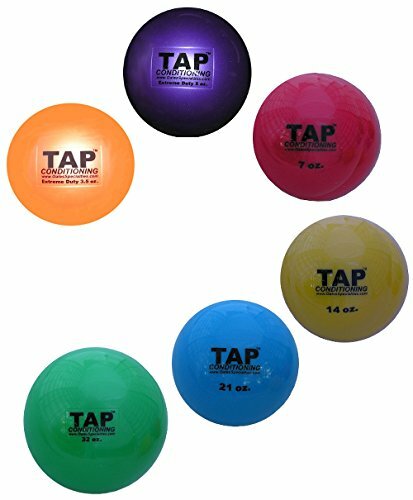 The TAP extreme duty weighted balls are designed for institutional and commercial use. The 3.5, 5, 7, 14, and 21-ounce balls are the approximate size of a Baseball while the 32-ounce ball is slightly larger. These sand-filled Mini-Medicine balls are pliable, squeezable and easy to handle. They are ideal for exercises and drills in environments where rebounding is not desired. Resilient and small, these weighted balls were designed to be used in close quarters as tools to improve arm strength and increase arm speed. They are excellent tools for providing resistance through the full range of motion used in throwing. They can be thrown against hard surfaces, padding, or net. These weighted implements are not toys and should be used with proper Instruction and supervision in areas where there are no sharp edges or points. Ninety day limited warranty against manufacturing and material defects. Instructions for use not included. If you have any questions about this product by Tap, contact us by completing and submitting the form below. If you are looking for a specif part number, please include it with your message.